To understand your audience is a pivotal part of any marketing campaign. This understanding drives a whole bunch of decisions which a marketer needs to take in order to deliver a successful campaign. One of the biggest decisions is medium or platform of the campaign. In the world of digital it becomes extremely tempting for marketers to go in for the “Out-Of-Box” platforms of Facebook, Twitter and Instagram, because of the relatively low incremental cost of marketing on each platform. To see a brand thoroughly understand its audience and run a digital campaign specifically on a channel that caters to that specific audience is like a breeze of fresh air. 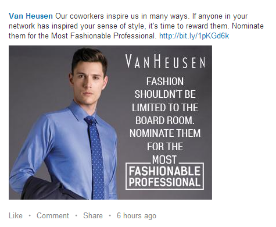 Urbane clothing brand Van Heusen, one of the leading lifestyle brands for men and women, maintains a professional yet chic brand image targeting working professionals in the corporate chain. 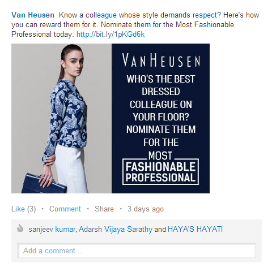 What better platform than LinkedIn to host a contest for professionals? After all, LinkedIn is the world’s largest professional social network boasting of over 300 million members, approximately 26 million of which are from India. 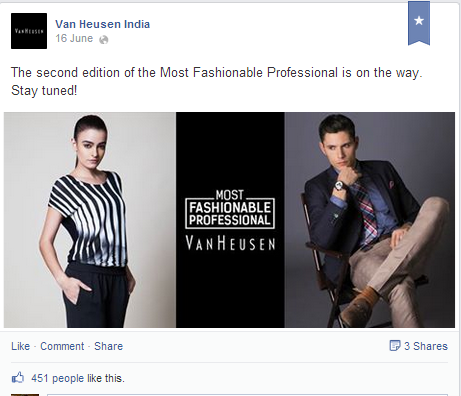 To overcome the challenge faced by the brand to reinforce their brand advantage among young working professionals. 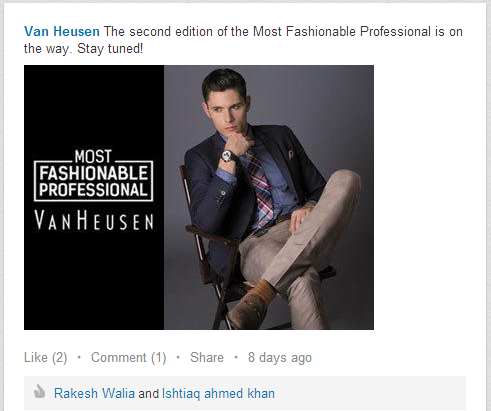 Second year in a row, Van Heusen is running a campaign to find the most fashionable professionals amongst the Indian LinkedIn network, using LinkedIn to strengthen Van Heusen’s brand value by connecting directly with young working professionals. 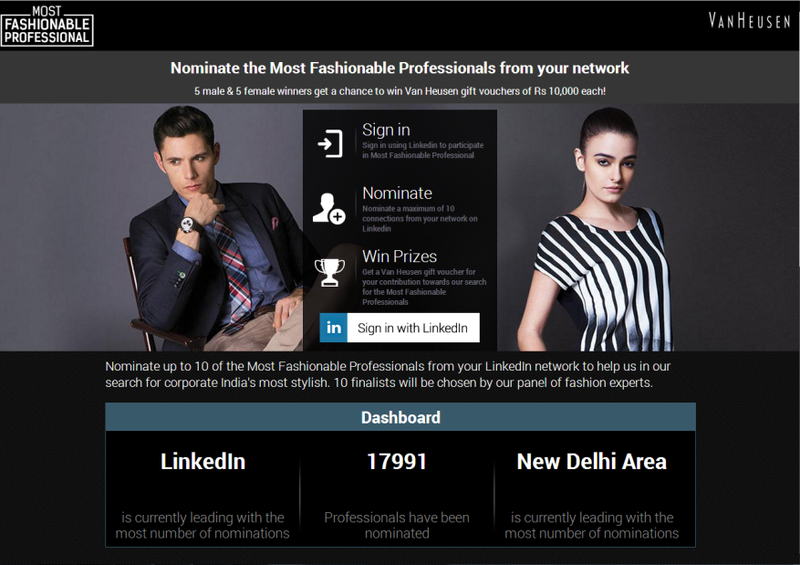 The brand has launched an exclusive micro-site called “Most Fashionable Professional” where members can log in using their LinkedIn credentials and nominate up to 10 connections as the most fashionable professionals on their network. A panel of experts will choose 5 male and 5 female best dressed professionals from the nominations received, who would win gift vouchers worth Rs. 10,000. The micro-site populates a leaderboard as and when new nominations are received in order to gamify the experience for the members and their nominations. Along with the leaderboard, the micro-site also offers recommendations from various fashion professionals and corporate head honchos about how people can dress fashionably for work. To nominate their connections, members get a one-time gift voucher of Rs. 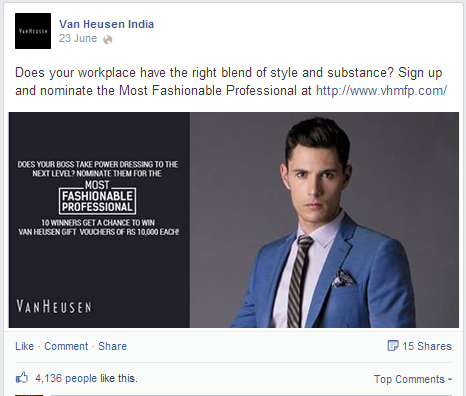 500 which they can utilize on their next purchase from Van Heusen. 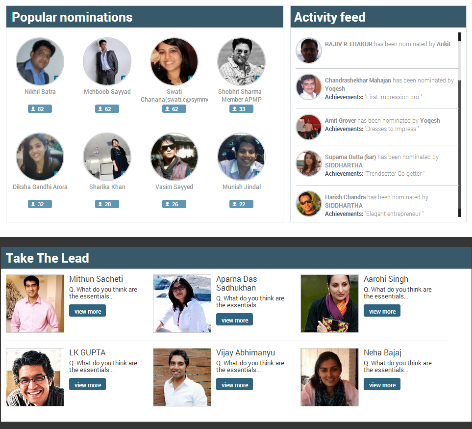 On log in, the microsite pulls up a list of your connections and enables you to nominate them for this contest. Once you nominate a connection, you also need to define their fashion statement from one of the many options given like Boardroom Classy, Trendsetter Go-getter, Dresses to Impress, etc. 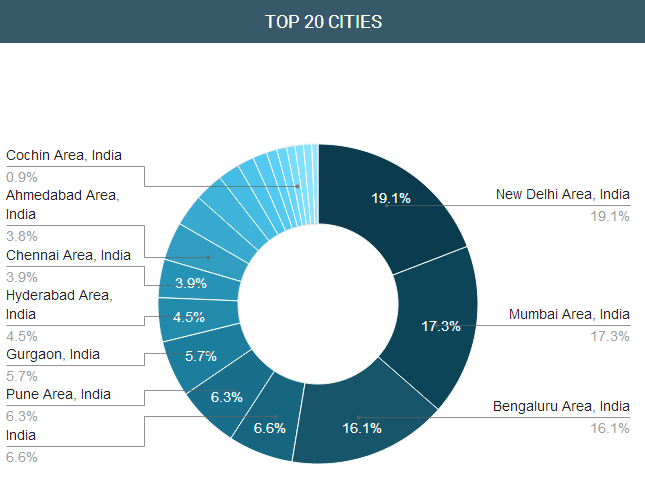 The microsite also gives some further insights on the nominated professionals, which city, company and designation they belong to. The ongoing campaign was launched on 16th June via posts across all their social networks. The entire campaign is run out of the LinkedIn API, using Facebook and Twitter for cross platform polinisation of members. The use of LinkedIn as the sole channel of communication and nomination mirrors the brands maturity in terms of understanding their audiences. Being a premium brand with over 8 lakh followers, they are in an excellent position to reach out to their audiences even with the minimal posting strategy they follow. The added gamification aspect in the website creates a sense of competition amongst the various cities, companies and nominees themselves. LinkedIn is rare choice for B2C marketers to reach out to their audiences. LinkedIn has succeeded in showing its capabilities in planning and executing a great B2C campaign making it a win-win situation for both the companies. Being a premium fashion brand comes with high expectations. Users see all brand communication with the same expectation as they do the brand. The microsite falls short of its design expectations and can definitely use some tips from the brand’s designers. 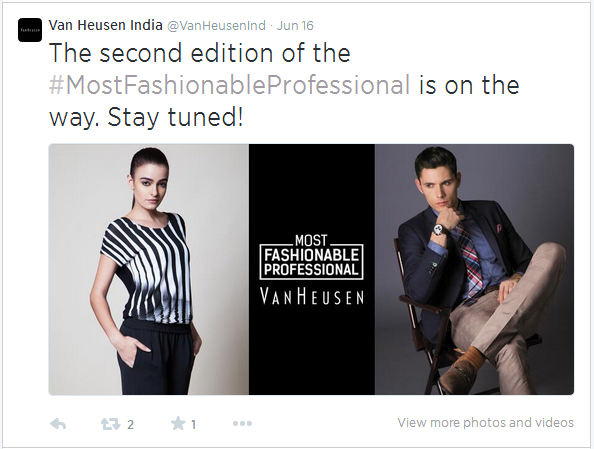 Even though the microsite is clean, minimal and has a clear path of completion, the user interface in terms of colors and design language can use a Van Heusen style makeover instead of the dull and boring LinkedIn design. When you do go in, expect a rather short visit to the microsite since there isn’t much one can do once the nominations are done. The gamification aspect could have been taken to the next level, with badges, points, social sharing being some of the features which could have been easily adopted to increase visitors engagement with the microsite. 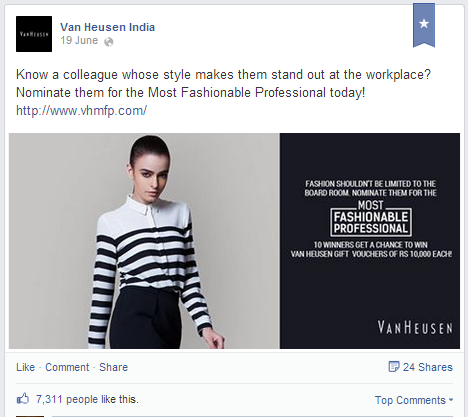 With last year’s campaign winning a Bronze in the “Best Use of Social Media” at GoaFest 2014, Van Heusens experiment with this initiative seems to be finding momentum. This year too with nominations shared across LinkedIn, Facebook and Twitter, it should ensure amplification for the brand’s messaging amongst fashion-minded consumers.